A meeting of the two premier North Carolina college ball clubs on Sunday resulted in an 8-1 rout of the number one ranked North Carolina Tar Heels at the hands of the NC State Wolfpack, led by top pitching prospect and staff ace Carlos Rodon. The Wolfpack struck early, scoring a run in the first inning on a RBI single by Tarran Senay, scoring Trea Turner and giving NC State an early 1-0 lead. NC State would strike again, this time with four runs in the third inning. The Wolfpack would put on a hitting clinic in the third, started by a one-out double by Brett Austin who would come around to score on a Grant Clyde RBI single. Brett Williams would rip a double to deep left field, scoring Clyde, wherein Williams would be brought home on a RBI single by Bryan Adametz. Logan Ratledge would round out the inning with an RBI single of his own, scoring Adametz in the process. In all, Tar Heels staff ace Kent Emanuel was lit up for five runs on six hits over 2 2/3 innings of work, by far one of his poorest outings of the season, a season that has seen the third-round draft pick in this year’s MLB Draft win 11 games. NC State would add three late-inning runs, one in the eighth off of a Brett Austin sacrifice fly and two in the top of the ninth. While the NC State bats were swinging, Carlos Rodon was wheeling and dealing on the mound. After walking Chaz Frank to start the game, Rodon retired 14 straight batters before surrendering a single to Brian Holberton in the bottom of the fifth. Rodon would continue to cruise along, displaying his diverse pitch arsenal that is highlighted by an explosive high-90s four-seam fastball and a sinker with hard action, both of which he complimented nicely with a solid 12-6 curveball on the afternoon. 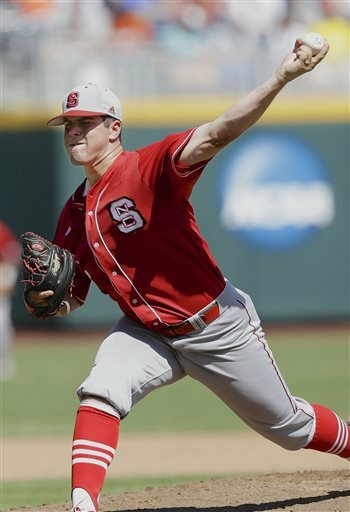 Despite surrendering an RBI double to Landon Lassiter in the bottom of the ninth, Rodon would finish the game and cement the victory for the Wolfpack in the Day 2 College World Series opener. With their first College World Series victory since 1968, NC State will go on to face either UCLA or LSU on Tuesday, while North Carolina will face the loser of that game in Tuesday’s losers bracket game.